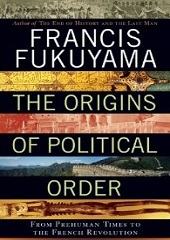 Order "The Origins of Political Order" here. 1. What is the biggest problem confronting Latin America? 2. What does the rise of populist leaders in the region symbolize? 3. How does entrenched poverty wreak havoc on the region’s societies? 4. Where are these problems most pronounced? 5. What are the most serious challenges facing the United States? 6. Is the United States as mobile a society as most Americans think? 7. Why is the United States becoming increasingly unequal? 8. What made this painfully apparent? 9. Does the U.S. financial industry still have too much power? 10. And finally, what will it take for the United States to get back on track? The quotes in this Read My Lips are drawn from Mr. Fukuyama’s “The Origins of Political Order: From Prehuman Times to the French Revolution,” published in April 2011 by Farrar, Straus and Giroux.